You know a famous golf place is on a strong track when you just feel at home there, in a close and natural way, as if you’d lingered a few decades exploring its every mystery though, in reality, you’ve spent a few all-too-brief days enjoying a few rounds with friends old and new. With the opening of the new Pinehurst No. 4 after a year-long renovation under the direction of architect Gil Hanse and his longtime business partner and lead shaper Jim Wagner, the “Home of American Golf” mystique is magnified, deepened and elevated to a realm reserved for royalty — St. Andrews-Long Island-Monterey Peninsula royalty. After spending a flawless fall afternoon on the new Pinehurst No. 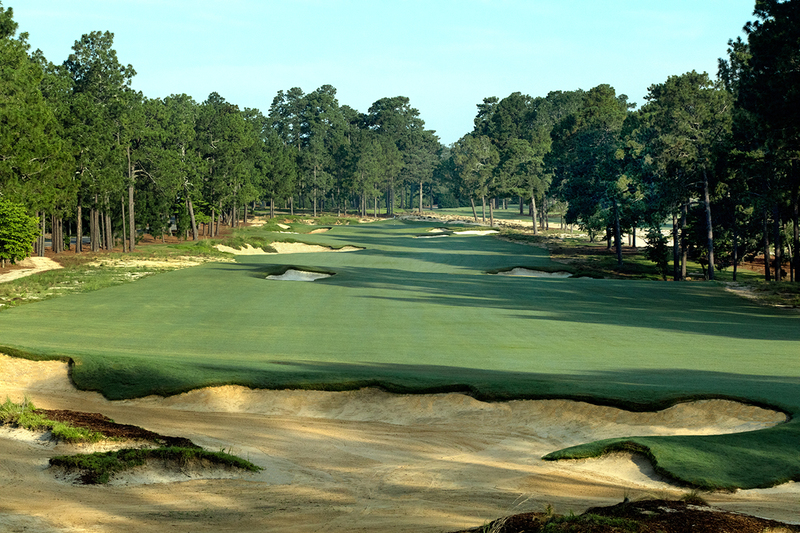 4 — which occupies some of the sprawling Pinehurst property’s most dramatic real estate, right next to No. 2 — I couldn’t get over how much more alive the entire enterprise feels compared to my previous visit nearly a decade ago, when the nation was in the throes of near-economic collapse and many destinations were struggling to find their way forward. In short, I felt a fresh magic in the Sandhills. That’s not overstated, it’s just what is there, wafting among the pines, and in part we can thank a bunch of Cavemen for it. “The Cavemen” is Hanse’s nickname for the handful of skilled sculptors and tenders of turf who turned his and Wagner’s vision for Course No. 4 into roiling, rangy, championship-caliber reality. Under the direction of Wagner and superintendent Kevin Robinson, the Cavemen transformed what had been wall-to-wall turf and trees, originally laid out by Donald Ross but tweaked over the decades by Tom Fazio and others, into a glowing necklace of swooping, heaving holes that, like Bill Coore and Ben Crenshaw’s careful reworking of Ross’s No. 2 masterpiece next door, bring the Sandhills’ original golf look back to the fore. Secret Golf's Steve Elkington visits Pinehurst #2 and Tobacco Road Golf Club in North Carolina, and reunites with legendary caddies, Willie Miller and the late Willie McRae. 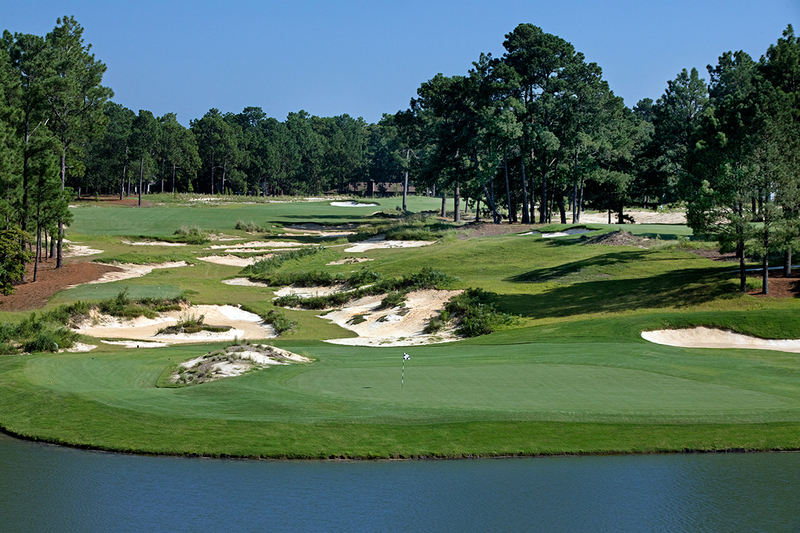 Their work, and Hanse’s, also stands starkly apart from Coore and Crenshaw’s in flow and feel, though at first glance they appear quite similar — tight fairways bleeding into rough-edge “blowout” bunkers and waste areas, which blend into primary rough punctuated by tufts of tall wire grass, which finally give way to the loblolly pines that have given this place its golf identity for more than a century. While the “new” No. 2, which reopened in advance of the back-to-back men’s and women’s U.S. Opens in 2014, builds its power via individual “set piece” holes, No. 4 offers more collective visual drama. Parts of 15 holes are visible from one of the course’s high points, the cliffhanging green on the par 3 sixth hole; a deep bunker separates the putting surface from the large lake that most fully illustrates how different No. 4 truly is from its famed sibling, though Hanse credits No. 2 for his chief inspiration. “With Course 4 we tried to reconnect the landscape,” Hanse said. “When we looked across at No. 2 and what Bill and Ben were able to do, that’s what started this. Bill tells the story that prior to the start of Course No. 2’s restoration, some mythical figure popped out of the mist and said to him, ‘Don’t F this up.’ He knew how important Course No. 2 was to this community, this resort and this population. They did as good a job as anyone in the world could do. For us to walk through their work, their interpretation of what Ross did, that was really a great opportunity. No argument here. No. 4 is now an absolute must, and the reasons are legion. It’s is more player-friendly than No. 2, especially on and around the greens. Hanse lowered them to be more in harmony with the terrain while Wagner shaped them to be more “accepting” rather than “rejecting,” as Ross’ greens often are to stirring (and sometimes frustrating) effect. 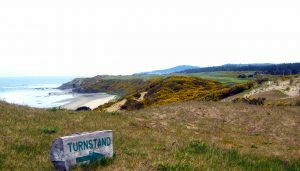 Bunkers are bigger, bolder and wilder, pushing into and across fairways to create more definitive aim points and broaden strategic choices — as on the stout par-5 ninth and the “gettable” par 4 15th, which yielded one of two birdies on my card. The other came at No. 11, the third of four gorgeous par 3s; No. 14, meanwhile, is the lone lakeside one-shotter, the perfect follow-up to the Cape-styled par-5 13th. From the opening sharp dogleg-right to the slightly uphill, left-moving 18th, No. 4 unfolds in this way, maintaining a firm rhythm throughout even as Hanse works in pleasant grace notes and surprising shifts in tempo. For me the round reaches its crescendo at the straightaway par-5 17th, which moves beautifully through a shallow valley with two bunkers jutting sneakily into the lay-up zone. I went driver, 8-iron, 8-iron to get home in three, then goosed a downhill birdie putt to leave a wicked comebacker, which I missed. Too bad I couldn’t go back and play that instant classic again to atone, but I can’t complain — Hanse gave me a clear and friendly shot at glory there and several other times during the round. I felt both welcomed and challenged. To me, that’s the clearest difference between No. 4 and No. 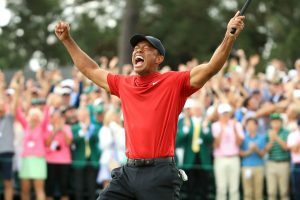 2: The former is a credentialed bucket-lister that tends to take no prisoners, leaving the average golfer bloodied but feeling blessed to witness Ross’ genius in the flesh. With its friendlier greens, wider driving lanes, new-but-old charm and epic, inviting scale, No. 4 begs for an immediate replay. It also puts Pinehurst as a whole onto a path of come-one, come-all popularity that, from where I stand, has no end. The Deuce, which overlooks the 18th green on No. 2. While No. 4 starts racking up the accolades on the Pinehurst golf front, there’s plenty of new activity elsewhere at the resort, especially if you like to eat and drink. Overlooking the 18th green of the No. 2 course is The Deuce, a cut above most golf grills in that, well, it’s next to the most famous course in North Carolina, and also happens to be stuffed with images and memorabilia of the area’s deep golf history. 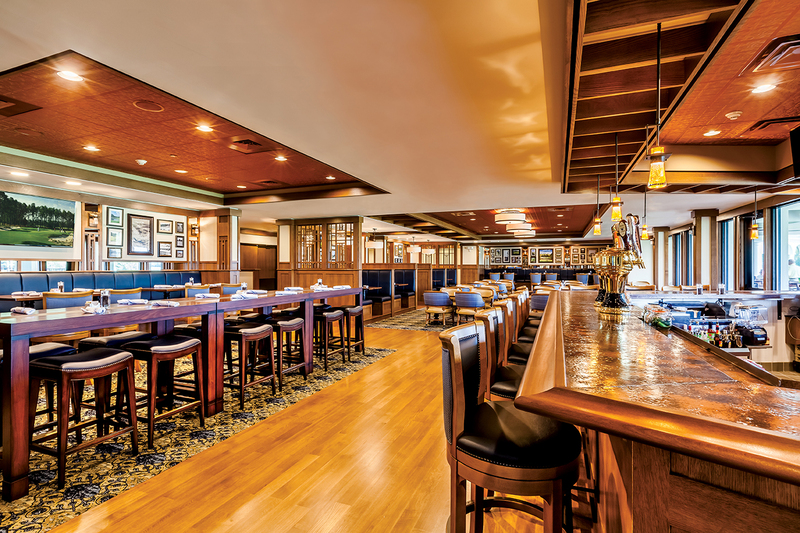 The burgers, appetizers, salads and entrees offer Southern flair in getaway-friendly abundance, and its bar’s taps — as with all of Pinehurst’s saloons — pour one or two local and regional microbrews. Speaking of which, the Pinehurst Brewhouse opened in mid-October in a former steam house that dates to 1895 and provided heat and electricity to the Holly Inn just up the road. The handsome, impeccably restored brick building immediately filled to the brim with golfers, other vacationers and thirsty Village folk. Pinehurst management lured master brewer Eric Mitchell away from Heist Brewery in Charlotte, where his IPA, Citraquench’l, was a perennial Top 10 award winner; he’s now putting his talents into producing killer pale and brown ales, witbiers and blondes in Pinehurst’s 10-barrel facility. The restaurant’s barbecue dishes are smoked in-house, and most herbs — used in food and some of Mitchell’s concoctions — are grown onsite. There’s a year-round heated patio, beer garden and plenty of frothy mirth to go around. Of course, Pinehurst offers its traditional charms, too — the intimate and historic Holly, the stately Carolina Hotel with its unbeatable breakfast buffet, the Manor Inn, a full-service spa and a wealth of pubs, and restaurants and shops in the Village. And, oh yeah, a few world-class golf courses. During the busiest seasons — which is just about every season at Pinehurst these days — pace of play is an issue. Or was. 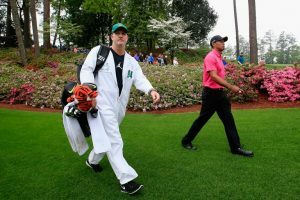 In keeping with Dedman’s commitment to modernizing the resort on all fronts, Pinehurst has partnered with Tagmarshal to install its sophisticated geo-tagging and pace algorithm software into its marshaling and player tracking system. More than 200 golf courses across nine countries use these small “tags” clipped onto golf bags or installed on carts to identify slow groups so on-course marshals can take care of pace challenges before they get serious. Pinehurst is seeing a 15-17 minute decrease for each round on every course, including on Nos. 4 and 2, so you can keep that magical Sandhills rhythm going. See more photos from Pinehurst No. 4.